The last few remaining copies of the 2013/4 edition are available on sale now exclusively at the Mind bookshop at the reduced price of only £12.99 plus p&p – instead of the usual £18.49. Just click on the link here to bag yourself a bargain! With a new look and thorough update, this edition has our first full chapters on the new PIP including sample forms, Universal Credit and Welfare Reform changes. An excellent opportunity to check out the Big Book at a bargain price and see if it’s suitable for you or your organisation. After much anxious pacing we are pleased to announce the birth/publication of The Big Book of Benefits and Mental Health 2013/4 on 25th June at Mind. The little purple and blue bundle of joy weighs in at 2lbs 1 oz. and is available from the shop at Mind for 18.49 plus p&p. The sheer scale of both the rewrites this year and the sad loss of the book’s guiding hand and founding author, Judy Stenger has meant this announcement is a tad later than we had planned! Our apologies then and thanks for your kind patience. New this year are complete Big Book treatments of Personal Independence Payment (including page by page guidance/example forms to help you with the new forms) and Universal Credit (with a handy clulation sheet and building blocks to Universal Credit entitlement). Every chapter has been touched by the winds of welfare reform; ESA, for example has been updated with the latest January 2013 descriptors, ESA 50 forms and new sancctions regime. Another new chapter summarises all the cuts and changes to help you see the welfare reform woods for the trees. We look forward to your feedback on the book to help us improve for next year. While we aim to offer a friendly, informal, practical toolkit for the non-specialist, we hope that even experienced advisers will find interesting bedtime reading. You can get a flavour of the changes, new content and sample pages from excerpts from Big Book of Mental Health 2013-4. You can see a summary of what’s occurring and our current range of courses in the flyer. Of course once you’ve read the book you may want to see it live. If you can find a venue and up to 16 people and a spot of lunch we have training courses and we can travel. Just contact us for details of costs and to adapt courses to your needs. The presses are rolling on the new Big Book of Benefits and Mental Health 2013/4. which will be available exclusively via www.mind.org.uk/shop. Cover price is £18.49 plus p&p. The precise publication date will be confirmed when the first batch is on Mind’s shelves, but the challenge is on to have it out for solstice! You can register for an e-mail notification from Mind. The PIP chapter includes page by page example PIP2 “How Your Disability Affects You” questionnaire, with a facing page containing the full descriptors, DWP Guidance, Big Book comment and likely difficulties for that PIP Activity. Universal Credit has a step by step guide to the sums and a calculation sheet alongside full coverage of this “simpler” benefit (it isn’t!) which will slowly replace means tested benefits and tax credits. Other big changes apply to Housing Benefit (“the bedroom tax”) the Social Fund (goodbye discretionary fund) and Council Tax Benefit (a new postcode lottery undermines aims of Universal Credit)and Employment and Support Allowance (with modified descriptors and ESA 50) . A new Welfare Reform chapter though will help you step back and see the welfare reform woods before getting up close and personal with the trees. The book has grown to 316 pages, but to make room for the new we have had to cut down on coverage of DLA, even though this will still be useful for some. However the full version of the DLA and AA chapter (with example forms and difficulties) will be available as a free download from this site. We are sorry that the sheer scale of changes and the impact of the sad loss of Judy Stenger means that we are a bit later out than we’d like, but we still hope you will find it useful in these changing times. We’d love to hear from you about what you think and ways we can improve for next year. Next post will confirm shortly that it is on sale. Work is well under way on the 13th edition of the Big Book of Benefits and Mental Health 2013/4. The new edition will include new sections on Personal Independence Payment and Universal Credit as well as extensive revisions to most chapters as the chill winds of cuts and “welfare reform” work right through the benefits system. There will also be a handy section summarising all the changes in one place so that you can see the welfare reform woods for the trees along with welfare reform summaries at the start of each section to highlight what’s changed or is about to. Big benefit changes means that it’s a big a rewrite this year, and the work is all the harder without original Big Book author, the late Judy Stenger. However we hope that much of her original wit and wisdom will live on in the new edition and that revisions and additions would meet with her approval. Many thanks go to Neath Port Talbot Mind where the Big Book originated for their advice and support, along with practical input from the other half of the former Terri and Jude partnership at the Income Project. Also to Mind UK for their interest and support for a new edition. Between them we hope to keep the new edition grounded in the experience of claimants, advisers and recent policy work. 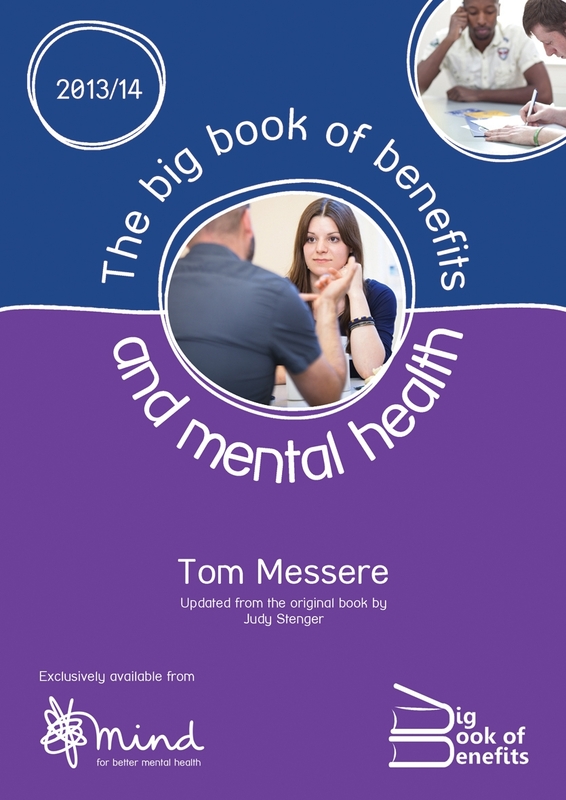 It’s twelve years now since the Big Book of Benefits and Mental Health first appeared. Since then much has changed – and things have got harder. Has there ever been a more difficult time to be a claimant? Probably not, this side of Beveridge. Certainly for those reliant on benefits paid on grounds of ill health or disability, anxiety is rapidly becoming a way of life rather than a diagnosis. Some of course have by now come through the first big wave of current change, their migration to ESA completed. So far the process seems to be a bit of a lottery: some have been fairly painlessly transferred to the Support Component without a face-to-face medical, others have inexplicably ended up on the Work Related Activity Component when they should doubtlessly not be, others still have been told that they are fit for work; in fact that’s been the experience of 37 per cent of old sickness route claimants. And it’s not just the actual migration and outcome which are hurting – it’s the sheer worry of it all – knowing it’s ahead and wondering what will happen. You don’t have to look far to find the casualties; you’ll find people who have been told they are fit for work – and who know that they are not – amongst any community, and here telling their stories on internet fora. Unluckier individuals form part of the 14 per cent rise in the homelessness in England in the last year. And the hardest hit of all find their names recorded for posterity. Be assured that we won’t forget. And ahead lie myriad more cuts, the replacement of DLA with the Personal Independence Payment and the coming of Universal Credit. We hope that the book – and now this blog – will continue to help, even in this grim time.